From the outside, the iPhone 3GS looks exactly like the iPhone 3G, and that's a good thing. It's slim and sleek, measuring 4.5 inches tall, 2.4 inches wide, and .48 inches deep. 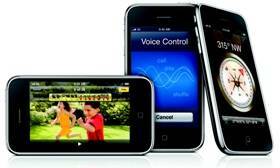 The iPhone 3G S weighs 4.8 ounces. Like the iPhone 3G, the new model comes in black and white versions, and sports a 3.5-inch touch screen. The iPhone 3GS is impressive, no doubt. It may be the best smartphone on the market today, and that's saying something given the many excellent options that smartphone shoppers have today, such as the Palm Pre, the BlackBerry Bold, and the BlackBerry Curve 8900. The cheap iPhone 3GS is not the greatest and the latest iPhone. But, while it may not have all the features found on the Apple iPhone 4, the iPhone 3GS remains one of the best smartphones on the market, hands down. Plus, it doesn't come with those pesky antenna problems that have plagued the iPhone 4 since its launch. And, with its price lowered to $99, the iPhone 3GS is one of the more affordable smartphones, too.